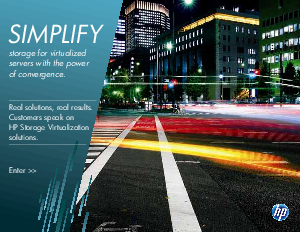 > HP and Intel® Xeon® processor > Real solutions. Real results. Customers speak on HP Storage Virtualization solutions. Data volume is rapidly increasing for IT organizations around the world. According to IDC, unstructured data is growing at 62% per year. This interactive document sponsored by HP & Intel outlines storage solutions available today and reveals customer opinions. See case studies and success stories, and discover how a Converged Infrastructure could benefit your organization.